Hello, I'm one of the 100,000+ people who have purchased this bike. Mine is a nice 1997 beige one. She belongs to the last generation of 600 cc Transalps ('97, '98 and '99), easily identifiable by their twin rotor front disk. 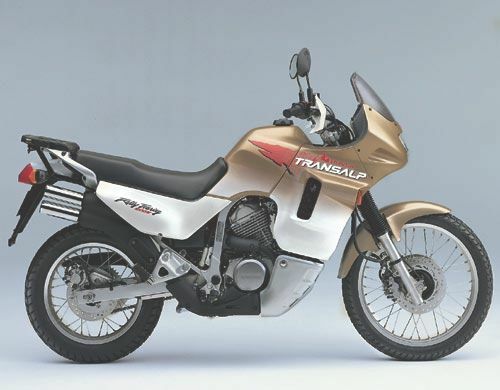 If you are unsure as to what year or original country your Transalp is, drop me an e-mail and tell me its VIN, if it's 600 and European, I can find the answer. A record of every money unit I spend in my bike (except from gasoline) from the very moment I have bought it. A report about my friend-made stainless steel muffler. A couple of nice bike links. What's a site without these? A page about XL600V's specifications and performances. Includes: how fast should TA go at a given regime? Also tables of codes for colors, and engine numbers and frame numbers for different countries and years. A page containing a list of some parts and accessories, with prices. A few pictures. Some of my TA, a scanned article from Ride magazine (UK) plus a pic of both Chris's bike&wife, and a scanned Transalp brochure. 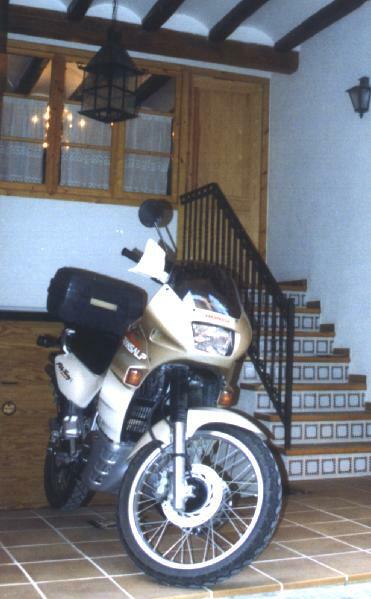 Also, a scanned article from Spanish magazine Solo Moto 30, where TA650 is compared to BMW F650GS. 03/07/04. Replacement of oil, filters, chain kit and tyres, wow! 03/02/07. Change oil and brake pads. 03/01/23. 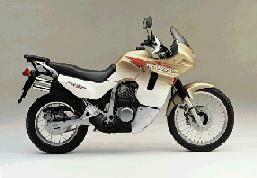 Scanned article from Spanish magazine Solo Moto 30, where TA650 is compared to BMW F650GS. 02/07/31. Maintenance and spokes bill. 02/07/17. New tyres. New muffler. Want to join the Transalp Webring?